In the introduction to The (New) World Tobacco Issues (Cartophilic Society of Great Britain, 2000) Gordon Howsden refers to the common description of cigarette cards as ‘The poor man’s encyclopaedia.’ From birds of paradise, to the monarchs of England, to fine art – the subjects depicted on some cigarette cards indeed seem to explore themes that when collected present a repository of knowledge about both the natural world and the culture and history of man. In particular, I have been interested in the depiction of fine art subjects on cigarette cards; the use of images produced by the great masters seems to form an interesting tension with the fact that artists who produce the images for cigarette cards are largely anonymous. 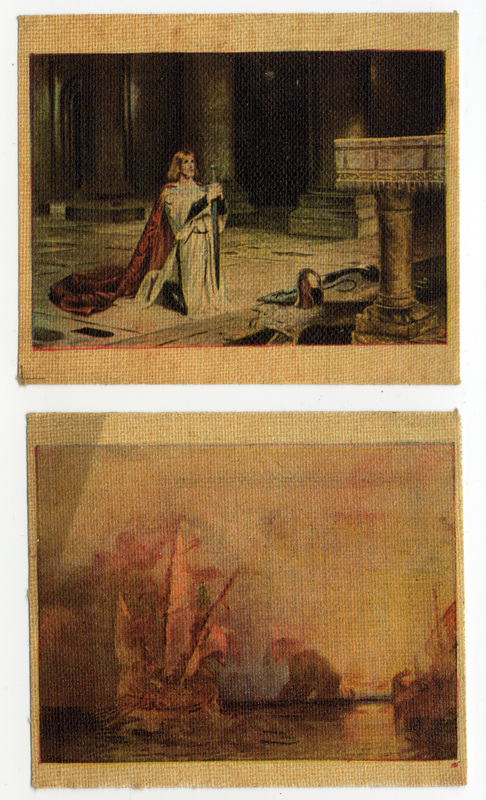 What kind of art is it possible to find in a fine art series of cigarette cards? Subjects range from classicism, such as the works of Ingres and David, to Dutch genre scenes, including those of Pieter de Hooch, and even works produced by English painters, such as Turner. Upon examination of such cards, what is perhaps most notable is the sometimes crude transposition of the images onto card or silk. 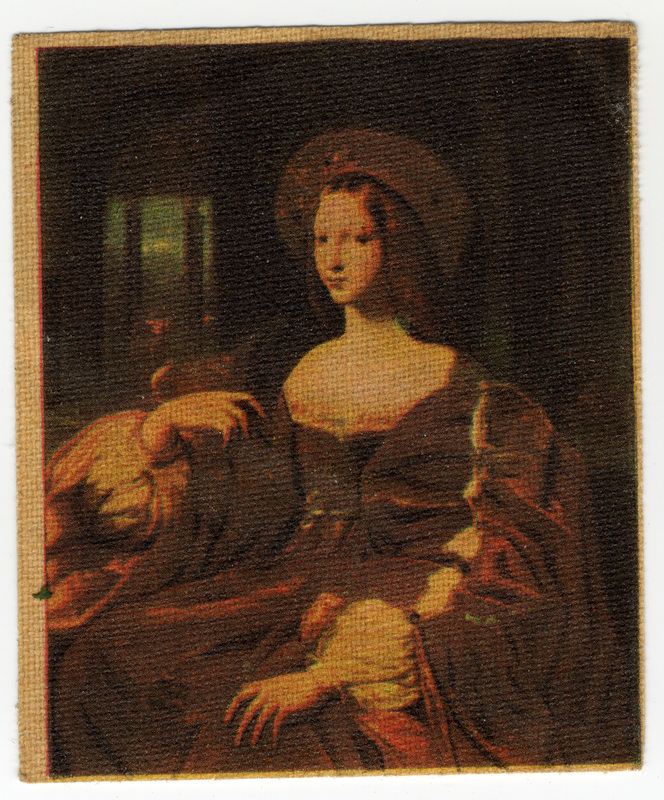 Whilst it is clear that this is most likely due to the realities and limitations of available printing methods (naturally it is impossible to depict in miniature form an image that is faithful to the original in both colour and form) this might suggest something interesting about the function of such cards in a collection. Arguably, the works depicted all belong to the Western canon; the collector is reminded of the great masters and their works by the crude miniature copies that sit in their collections, standing as encyclopaedic metaphors for the works themselves. It is interesting to consider the purpose of collecting symbols of works of art, as represented by a fine art series. Fine art has long been associated with moral improvement; Winckelmann, a German art historian of the 18th century, often said to be the father of the history of art as a discipline, was among the first to praise the moral edification to be offered by the consideration of classical art. Such a view has been promulgated and strengthened up until the modern day; the notion of art as ‘good for the soul’ is arguably a key factor behind the rationale of the art museum. Perhaps cigarette cards depicting fine art can be located within such a discourse. In accumulating such cards, the collector is not only acquainting himself with the Western canon, but also furnishing himself with a kind of culture and civilisation. Such an assertion chimes with the fact that classical and Renaissance subjects feature fairly prominently within such series; tied to notions of the Academy, classical history painting, which sits at the apex of the hierarchy of genres, was often thought to provide the greatest moral improvement for the viewer. 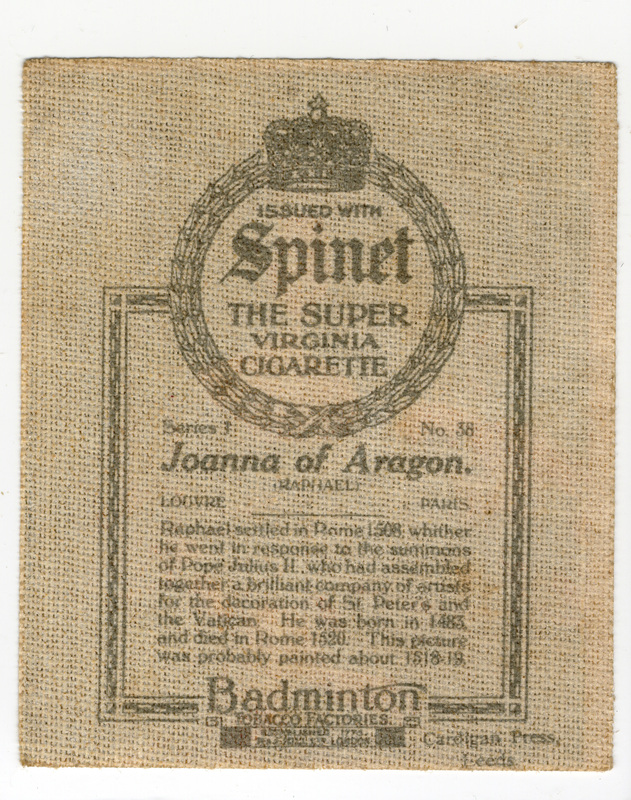 Returning to the notion of the ‘poor man’s encyclopaedia’, it might be suggested that in the production of such series of cards, cigarette companies sought to provide individuals who may not have acquainted themselves with culture on a regular and conscious basis, with some form of cultural contact. Individuals would have collected these images of old masters alongside their collections of popular culture, seen in film star series, the natural world, and the history of England. Within such a spectrum, fine art forms one facet to a multi-dimensional encyclopaedia, acquainting individuals with a myriad of fields perceived as important to notions Western knowledge and culture. Cigarette card collections might indeed be described as encyclopaedias.